Sunflowers are gorgeous, but not only do they brighten up every room, sunflowers are actually very good for you in their microgreen form. As it turns out, they're not just a pretty face. Also known as Helianthus, sunflowers come in many varieties, and the ones that you're probably most familiar with are the H. annus, the domesticated variety. While these flowers are not very popular for gardens because of the fact that they spread very quickly and become to invasive, they're highly manageable in microgreen form. In terms of nutrition, over 25% of its content is protein, and they are rich in vitamin B and hormone-balancing zinc. During its germination process, the sunflower’s nutritional value increases from 300 to 1,200%. Sunflower micros’ high iron content and chlorophyll aid in combating amenia and the detoxification of the liver and blood, respectively. They also have the ability to clear the lungs of congestion. 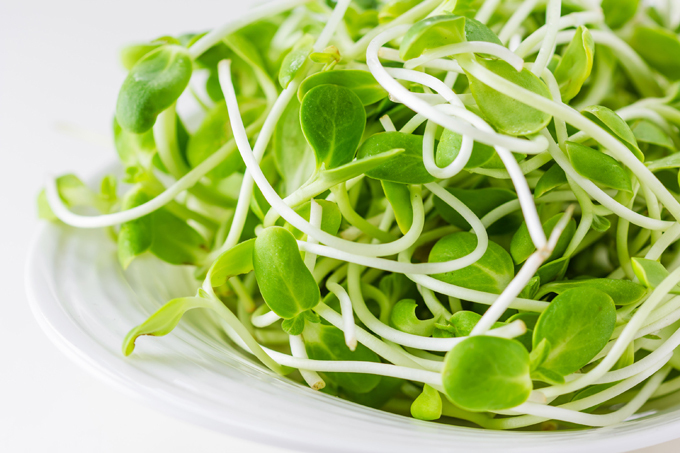 Sunflower microgreens are also rich in zinc (which is an essential mineral for men) as well as folate (an essential mineral for pregnant women, aiding in the development of the baby’s nervous system). Considering their sweet, earthy flavor, and crisp texture, sunflower micros are a great snack and can easily be incorporated into a number of dishes. Try this dish on for size! Cook the potatoes: Put the potatoes on a small baking sheet. Drizzle with the olive oil and season with salt and pepper, to taste. Put the tray in the center of the oven and cook until the potatoes are tender when pierced with the tip of a knife, about 20 to 30 minutes. Set aside. Cook the pasta: Bring a large pot of water to a rolling boil over medium heat. Add the 2 tablespoons salt and bring the water back up to a boil. Add the pasta and cook for 3 minutes. Stir the pasta with a slotted spoon to make sure it does not clump or stick to the bottom as it cooks. In a large colander, drain the pasta. Reserve 1/2 a cup of the pasta liquid, in case it becomes necessary to use it later on. In a large skillet, combine the heavy cream and sour cream. Season with salt and pepper, to taste. Reduce the cream over medium heat whisking until it thickens and all of the sour cream melts, 3 to 5 minutes. Add the lemon zest, lemon juice and a "splash" of Worcestershire sauce. Taste for seasoning. (*See Cook's Note) Stir in the chives. Add the pasta to the skillet and toss to coat with the cream. Shut the heat off and allow the pasta to "rest" for 2 minutes, tossing to coat, from time to time. Meanwhile, put the potatoes on a flat surface and use a sharp knife to slice them into 1/2 to 3/4-inch-thick rounds. Stir the potato slices into the pasta sauce. Serve the pasta: Warm the serving bowls. If the cream is overly thick, add a little more of the pasta cooking liquid and swirl it around over the heat for a minute. Stir in the sunflower greens and spoon the pasta into the bowls. Serve immediately. With an Urban Cultivator, you can grow your own sunflower micros in as little as two weeks. All you have to do is plant the seeds, and the Urban Cultivator, with its automated watering, lighting, and temperature functions, will take care of the rest. Learn how to grow sunflower microgreens in an Urban Cultivator below. Do you have a favorite recipe for sunflower micros? Let us know in the comments section!